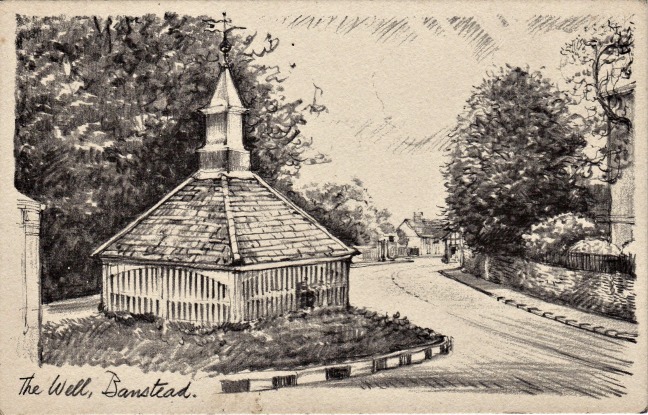 At some time during its illustrious contribution to Banstead’s cultural life, the Ibis Library produced a small selection of postcards of local scenes, including this one – a drawing of the Old Well. Unfortunately there’s no indication of the date (or, indeed, the illustrator): the only information on the ‘correspondence’ side of the postcard is “Published by : The Ibis Library, Banstead, Surrey” and “Sketch Reproduction Copyright”. Does anyone have any further information? The date will be around 1945 to 1950 I suspect, when the electrical transformer (see picture #64) partly seen on the left hand side was still in situ. The black and white lines around the kerb also suggest it was around or after WWII. I have another copy of this card in my collection and it was posted in 1951.